We are no strangers to organic gardening. Having space for a garden is high on our list of ‘wants’ when we look to live somewhere for an extended period of time. It’s important to us to be able to grow our own food. Even though organic produce is easy to find in Ubud, having a garden provides many valuable lessons to us and we find it our duty to show our children the symbiosis of nature. Baby yellow tomatoes are on their way! to cultivate a sense of self-sustenance. I believe that only when we have a sense of where and how the food that sustains us comes from, will we appreciate the importance of growing it in a loving manner. In this way, we can start to reverse the damage that has been done by GMO corporations mono-cropping food-like substances that are not natural to the human body and eliminate the need for chemicals to grow food. 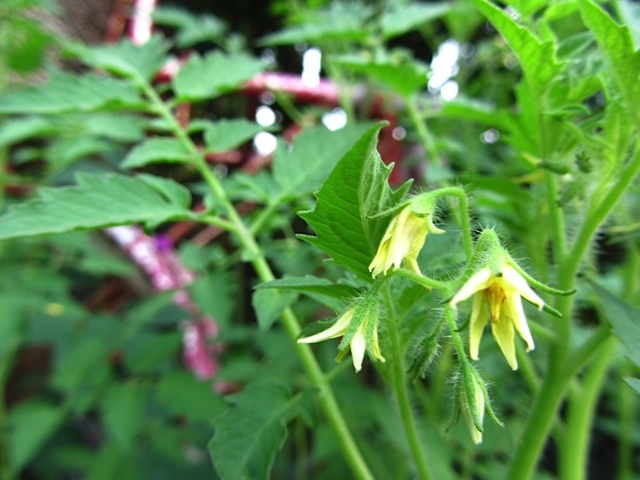 Our experience with organic gardening started when we lived in Colorado. Living in an arid desert like climate provided some challenges. Little rainfall with very low humidity meant we had to water the garden twice a day and keep it mulched. Mr. Keith set up an automatic sprinkler that made morning and early even waterings easy. My background as a certified master composter ensured that we had high quality, organically nourished soil. We also had to keep the critters away. We lived on 3 acres of sub-alpine desert with beautiful ponderosa pines that landscaped the property like a large-scale connect the dots worksheet. Deer and rabbits would roam, chomping the tastiest bits. We built an eight foot fence around the garden to keep the deer out, sinking it into the ground 1 1/2 feet to keep the rabbits from digging underneath. It worked really well. The grasshoppers invaded, bred and used our garden as an all-you can eat buffet. Destroying it. However, it came back and provided beautiful food. The hail hit. Hail the size of golf balls will crush a garden. Twice in our case. When we moved to Costa Rica, we knew gardening would be easier, right? After all, doesn’t everything grow in tropical climates? What we discovered is that yes, everything does grow and fairly quickly. 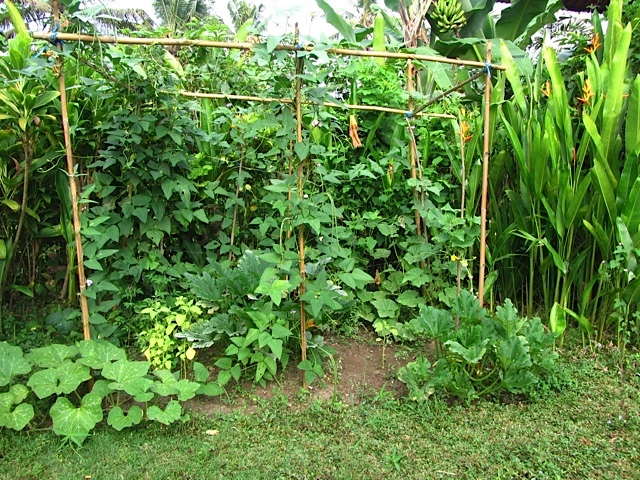 However, our garden needed protection from the heavy monsoon rains that pelted down every day during the rainy season. The roots were shallow because they didn’t need to reach down for water and as an effect weren’t strong enough to support the growing plant. 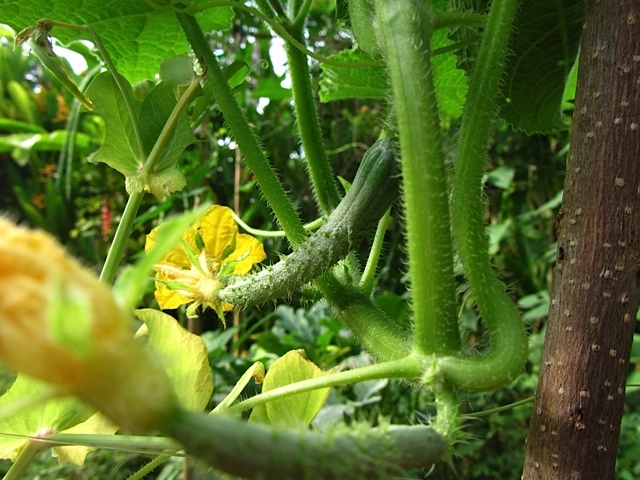 When we did have success at gardening in Costa Rica, it was a short lived excitement. The leaf cutter ants would find them and destroy an entire plant in one evening. The cunning little critters would arrive at night and we’d find their stomped trail in the morning, minus a few plants in the garden. After one year, we gave up. Organic produce was too easy and cheap to buy in Costa Rica and wasn’t worth the work involved with growing it in our backyard. We scaled back our efforts and grew just the few things that the leaf cutter ants didn’t eat. Fresh, sweet carrots in Costa Rica. We rent a beautiful open air house and the land next door to use as our yard and open space. 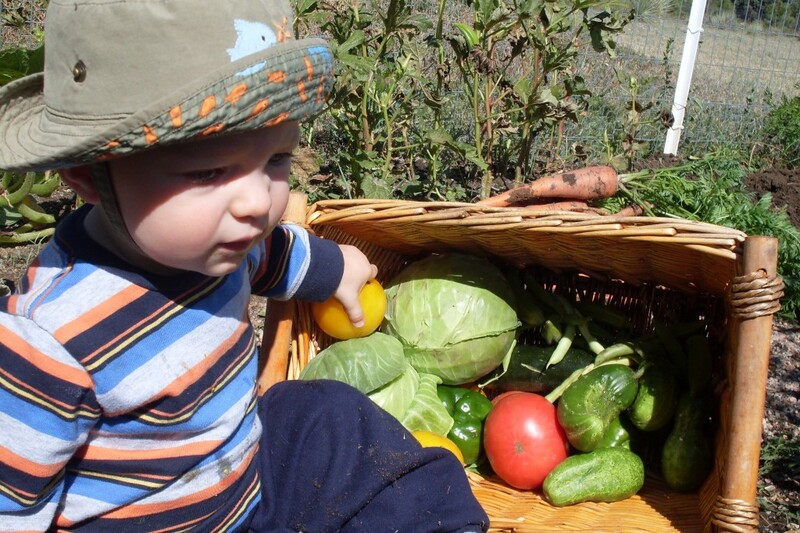 I had visions of G sitting in our beautiful Colorado garden, picking tomatoes off the vine and sinking his baby teeth into them. I wanted Miss I to have that experience as well. We’ve established a small garden where we grow pumpkins, green beans, long beans, herbs and tomatoes. We even planted okra to pay tribute to Mr. King’s southern roots, but it turned out to be a zucchini plant. 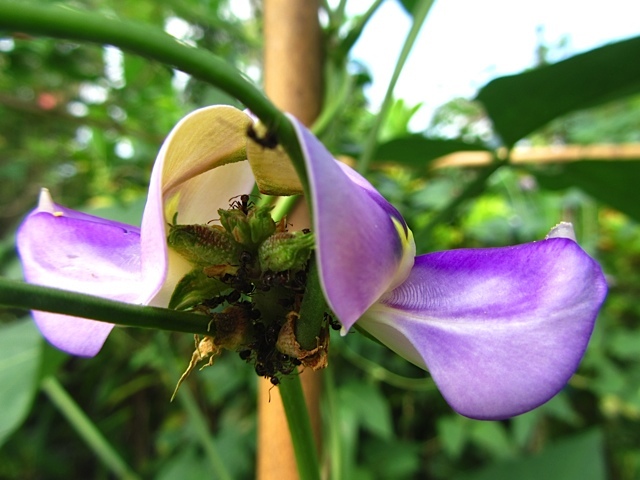 Are all the ants on our green bean and snap pea flowers a good thing or bad thing? Google has opposing opinions. Ants. Good or Bad? We don’t know yet. There are male and female flowers. Our pumpkin plant has large, yellow blossoms that were falling off and shriveling on the ground. Concerned that we’d have no pumpkins, we did research to find that the flowers were male flowers, solely designed to open and provide the pollen for bees to pollinate the female flowers on the vine. The female flowers were distinguishable because they had a little ‘bump’ at the base. 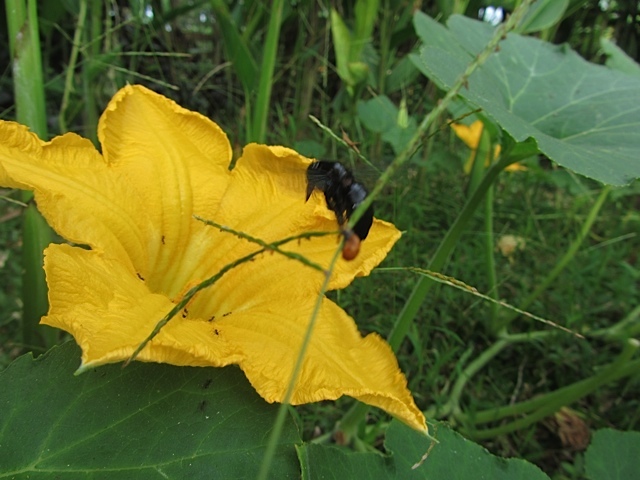 Pollen being carried from the male flower of the pumpkin plant. Thank you Mr. Big Bee. Are you a bee? 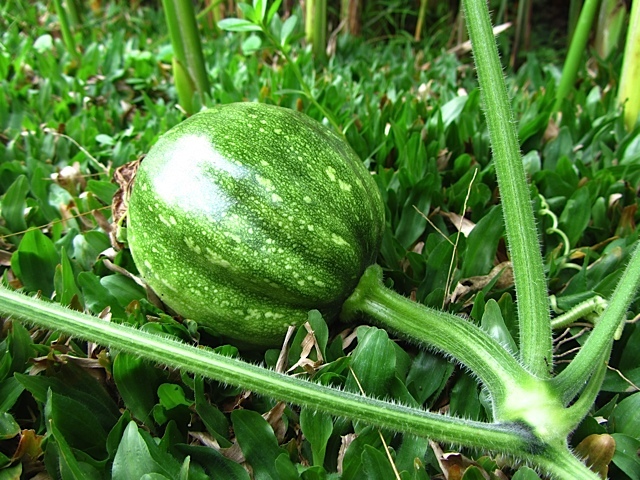 Yes…our first pumpkin got pollenated and is growing! The rich fertile soil of Bali can grow anything. Stick a seed in the ground and it will spring up. We haven’t amended our soil and our garden is thriving, despite, or perhaps because of, the ants. We have a joke saying that we don’t garden, we continually have to preen and whack. Things grow here quickly. Luckily, our yard is maintained by Made is is constantly pruning the trees, bushes and plants. Food from your own garden, touched with your own hands and spirit tastes the sweetest! The green beans hardly ever make it to the kitchen. They are eaten straight off the vine. 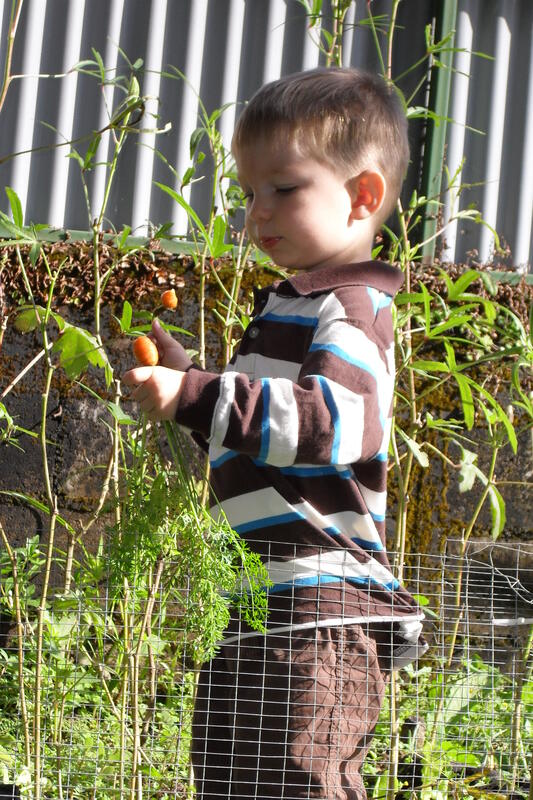 If you haven’t gardened or grown anything in the past, try it… especially if you have children. The lessons and experience of nature are too important to miss out on. You don’t need much space. A simple jar or pot or piece of ground will be able to grow everything from wheatgrass to cucumber plants. Even if you grow something that isn’t edible, you and your children will still appreciate the miracle of how a tiny seed grows into a full plant. I can’t wait to hear about your organic gardening experiences!